Today the ITM Bloggers are taking their first annual daytrip. We'll pack into the PT Barnum, strap the Tiny Shriner to his booster seat, and drive to a nearby celery farm (which we have rechristened Celery World, making it seem more exciting than it actually likely will be). I'm a little worried about Tiny, though. He stayed up far too late last night at the BABEL party. A small scandal is swirling around him: he was seen emerging from a closed coat closet with a well known medievalist who had been in the running for our annual Best Coiffed competition. Suddenly s/he had hair so rumpled that said medievalist was immediately disqualified. 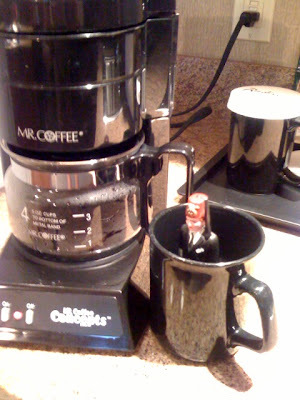 I just found Tiny in my coffee mug, insisting it is a very compact jacuzzi. He is about to learn otherwise.